So I papered my walls with rejections, too. It was easier than painting them. After a while I realized I needed to get a bigger apartment, for all the wallpaper. At first, I papered my walls (initially: my parents’ walls) with rejections from publishers. The Last President of the United States, Love the Agent of Your Death, The Secret Diaries of Copious Oates, Astonishing Truths — who could resist titles like that? More people than you might think, as it turns out. One day I saw an ad in Writer’s Digest for a big literary agency. 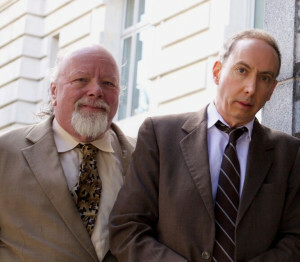 For $200, they would read your manuscript and tell you why it sucked. I sent Astonishing Truths in the same day, along with my check. I heard the snicker in the description. Agents must really be cool, I thought. After that I stopped sending my work to publishers and started sending it to agents. I learned that good agents will read your work, or a sample of it, for free. Soon I was papering my walls with rejections from agents. “We just didn’t fall in love with your manuscript,” a typical agent’s letter read. So now my writing life was reflecting my dating life. That was my concept of persistence. Write a novel, send it to everyone in the world who could possibly help you, and, when they all turn you down, write another novel. I didn’t know what persistence was, until I met Lee Hurwitz. But I’m getting ahead of myself. I bought writing courses on tape; style manuals; great writers on writing. I went to classes. I joined two writer’s groups — one helpful, one not. I attended seminars put on by the Washington Independent Writers, where agents would meet with you, discuss your story outline, ask for a sample chapter or two in a self-addressed envelope, and then, in a couple months, tell me that they didn’t fall in love with your manuscript. I was at such a conference in the spring of 2004. I had already found an agent to not fall in love with my magnum opus — I’ll tell you about that book later, or not at all — and was heading out into the chilly day. I was waiting for my ride. Lee was too, I guess. “I’ve written a story,” he explained. It’s a good writer-to-writer opening line. I invited him to tell me about it, in the hope that I could then tell him about my story. His story sounded pretty good. A corrupt Mayor of Washington (I know; unimaginable) is caught in the middle of a felony by a woman who has snuck into his office to steal a bid. He sends his minions after her and they chase her up and down the country. The quarry proves elusive and surprisingly resourceful. In the meantime, hizzoner is caught up in increasingly complex prevarications to cover up all the shenanigans. It sounded chaotic, and funny. Well, I had experience. I just hadn’t had experience doing it successfully. And look! Here comes my ride! I didn’t have a chance to tell him about my book. I turned around and gave him my e-mail. By the time I got home, his manuscript was in my in box. He called it Capital City. I liked it but I had a few ideas. Since I was into Shakespeare (still am), I gave the Mayor a sinister proclivity to quote the Bard during his worst moments. I invented a couple of characters — a straight-arrow protagonist; a loopy hit man (I imagined Steve Buscemi playing him in the movie). I shaved down the minutes for some characters; boosted them up for others. I applied the things I learned from all those classes on how to write good. It was a dream to work with Lee. He was adamant about two or three things, about which I acquiesced — wisely, as it turned out. Otherwise, he welcomed and encouraged my revisions. By early 2005, we had the best manuscript we could devise. He introduced me to his agent, the fabulous Diane Nine. I had always read that agents were forbidding people, who hated among all things to be bothered by authors. Diane took us out to dinner. She invited us to parties with potential publishers. And she worked like a dog. She worked about two hundred publishers during the course of 2005. She was relentless. And at the end of the year — nothing. So I took the advice of my mentor, W.C. I gave myself over to other pursuits. I wrote different stuff. I pursued the practice of law. I wrote theater reviews. When Pope Benedict stepped down, I left hints of my availability. Ten years passed. And then I got an e-mail from Lee Hurwitz. While I was suing people, writing critiques, and puffing up my papability, Lee was working — marketing the novel. No enterprise was too small — or too bizarre — for him to undertake if it would advance the novel’s fortunes. He even joined Sisters in Crime, an organization for women mystery writers — notwithstanding the fact that Capital City wasn’t really a mystery and Lee, not to put too fine a point on it, wasn’t a woman. The upshot was that, after ten years, he found a publisher…Astor + Blue editions, a good new house with a lot of ambition. 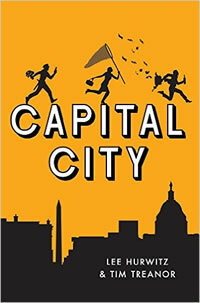 He found them; Diane signed them up; and now Capital City is good to go on November 1. Buttonholing people, making them listen to your pitch, shoving manuscripts at them, joining Sisters in Crime — if you’re like me, you’d rather ride in a cement mixer. A cement mixer full of cement. But that’s what Lee Hurwitz did, and it worked. I was reminded of another persistent cuss — not an author, but (how embarrassing!) the author’s mother. She cornered the great writer Walker Percy and pulled her son’s manuscript out of a shopping bag. Would he read it? “…There was no getting out of it; only one hope remained—that I could read a few pages and that they would be bad enough for me, in good conscience, to read no farther. Usually I can do just that. Indeed the first paragraph often suffices. My only fear was that this one might not be bad enough, or might be just good enough, so that I would have to keep reading. The manuscript was called A Confederacy of Dunces and it won the National Book Award. Alas, the author, John Kennedy Toole, was not around to receive it. One day a few years before Walker Percy read his manuscript, he put his car in park, got out a hose, put one end around the exhaust pipe and the other end through his window. Then he pushed on the gas. To be published today, you need persistence. Lee Hurwitz, my writing partner, I salute you. Previous PostMeet Donald Trump’s SupportersNext PostIs It Time to Shut Down the Republican Party?